EXAIR’s Adjustable Spot Cooler: A Versatile Tool for Your Cooling Needs! If you’re looking at replacing messy coolant mist systems, look no further than the Adjustable Spot Cooler. EXAIR’s Adjustable Spot Cooler incorporates Vortex Tube technology to produce temperatures ranging from -30°F – +70°F. A Vortex Tube works by imparting a rapid spinning motion to the supplied compressed air. This airflow makes its way to the end of the tube where it is forced to abruptly change directions. It is during this change of direction that energy is given off in the form of heat. The hot air then exits the tube from the hot end, while cold air exits the other end of the tube. As the valve is opened to allow more air to exhaust from the hot end, the temperature at the cold end will decrease. At a sound level of just 73 dBA when operated at 100 psig and stock generator installed, this compact cooler will keep your operation cool, clean and dry without causing unnecessarily high noise levels. When looking at a Vortex Tube based solution, the variety of options can sometimes be daunting. This is where the versatility of the Adjustable Spot Cooler shines. Through a simple turn of the control knob, you can easily adjust the temperature and cold fraction of the unit. Additionally, the kits come with (2) extra generators (15-H and 30-H) that can be swapped out for the stock generator for more/less cooling power and air consumption. The 15-H generator will deliver up to 1,000 Btu/hr of cooling capacity and the 30-H will provide up to 2,000 Btu/hr of cooling capacity. We have (2) different kits available, the Model 3825 Single Point and the Model 3925 Dual Point Kit. The 3825 is recommended for use in applications where you’re cooling a small surface such as solder joints, hot melts, or drilled plastics. The 3925 system is better served when heat is generated over a larger surface area such as saw blade cooling. The kits use flexible Loc-Line hose to allow you to precisely position the cold airflow onto your target. The Adjustable Spot Cooler provides easy mounting with a swivel magnetic base, allowing you to mount the cooler directly at the most critical point that heat is being generated. 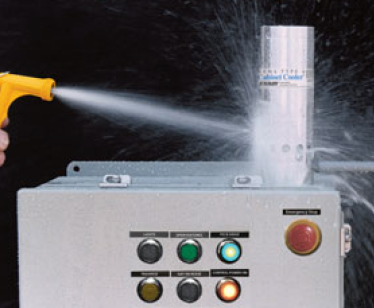 If you’re tired of cleaning up your coolant or have an application that requires dry machining, get one of the Adjustable Spot Cooler systems on order today. They’re in stock ready to ship! With the Summer heat upon us here in Ohio the inquiries for our Cabinet Cooler Systems are increasing by the day. A question we always ask customers with Cabinet Cooler Sizing Guides is, “What NEMA Type is your enclosure?” There are quite a few times where no one truly knows what a NEMA rating is. So what exactly is a NEMA rating? NEMA is the National Electrical Manufacturers Association, one of the many standards they publish is the NEMA rating standard for electrical enclosures up to 1000 Volts. This standard is where NEMA Types such as 12, 4, and 4X come from (you will also see an international standard reference as “IP”, more on that later). It categorizes the enclosures by their ability to protect the internal components from things such as corrosion, dust, oil, even external air quality. These standards are reviewed every five years and the last review was done in 2013. The reviews are generally based on improving safety, clarity of the standard, and testing methods. So what NEMA ratings does EXAIR offer? For our Cabinet Cooler Systems, EXAIR offers three very common NEMA types to try an offer a selection to fit the needs that we most commonly encounter. The NEMA types and their descriptions are below. For a full list of the Non-hazardous location NEMA enclosure types, click on this link. Type 12 (IP54): General purpose, indoor use. Protects against falling dirt and circulating dust, lint, fibers, and flyings. Protects against ingress of dripping and splashing water. Rust-resistant Type 12 enclosures do not include knockouts. Types 4, 4X (IP66): Water-tight, dust-tight, sleet-resistant. Resistant to windblown dust. Indoor or outdoor use. Also provides protection against splashing and hose-directed water. The “X” designation indicates corrosion-resistance. 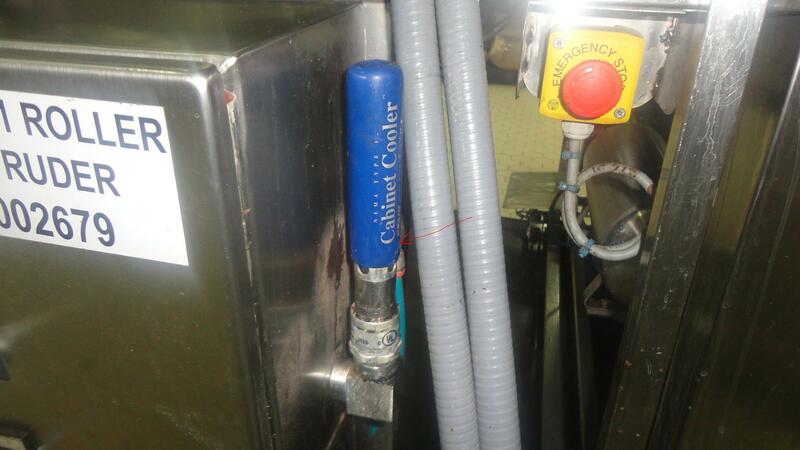 The EXAIR Cabinet Cooler Systems also reference an equivalent IEC (International Electrotechnical Commission), IP code. This is a code from the IEC system which specifies the ingress protection which classifies and rates the degree of protection provided against intrusion (body parts such as hands and fingers), dust, accidental contact, and water by mechanical casings and electrical enclosures. They are a two digit number that represents the level of protection against physical objects and he ingress of water. Coorelation between NEMA ratings and IP codes is not always possible. EXAIR has ensured that we also meet the equivalent IP codes shown in the NEMA descriptions above. If you have a hot enclosure and you are not sure how much cooling is needed or what the NEMA type is, contact us. We will gladly help you gather the information needed to calculate the heat load requirements and help determine the correct NEMA rating. Categories Cabinet Cooler•Tags a/c, air conditioner, alberta clipper, bdfarno, cabinet, Cabinet Cooler, cabinet cooling, control panel air conditioner, cooler, cooling electronics, electrical, electronics cooler, enclosure, Enclosure air conditioner, enclosure cooling, exair, exair cabinet cooler, EXAIR_BF, heat error, heat fault, high temperature, hot enclosure, industrial air conditioner, IP54, IP66, keeping it cool, NEMA, NEMA 12, NEMA 4, NEMA 4X, overheated, overheating, panel air conditioner, Panel cooling, sizing guide, Type 4, what is?